Our professional hand painted custom bollywood posters painters prepare your Bollywood style movie poster. Bollywood posters studio is a collective of the last few remaining Bollywood painters & Hindi film poster painters in India committed to reviving hand painted movie poster culture.Every single beautiful brush stroke is visible on canvas, which makes our hand painted Hindi movie posters true gems to add to your art collection.Our artists using quality oil paint blends on canvas, the beautiful brush strokes and vintage colors in our hand painted Hindi movie posters will add true style beautifully in your painting. We have designed more than 2,000’s Customized style Bollywood posters for our clients. To make your wedding unique share your ideas or contact our Bollywood posters studio’s team to design your Bollywood poster save the date poster. Customized your wedding bollywood poster like your favourite Bollywood movie posters. Add your photo and also special message in your Bollywood poster save the date poster to worth keeping and remembering. Design your hand painted custom Bollywood poster and create a statement that get noticed by your guests. Customise with confidence at Bollywood posters studio and get 100% satisfaction. In our unique custom Bollywood poster save the date cards service our team of Bollywood posters studio artists willcustom paint your faces in any of your favourite Bollywood movie posters. Bollywood posters save the save the date cards are interesting and unique idea. Bollywood posters studio offer quality work and product which memorized for life time and have no expiry date. Express yourself beautifully with the customized Bollywood save the date cards posters. Select your favourite Bollywood poster, or filmy pose and simply add your photographs instead of actors and actresses. 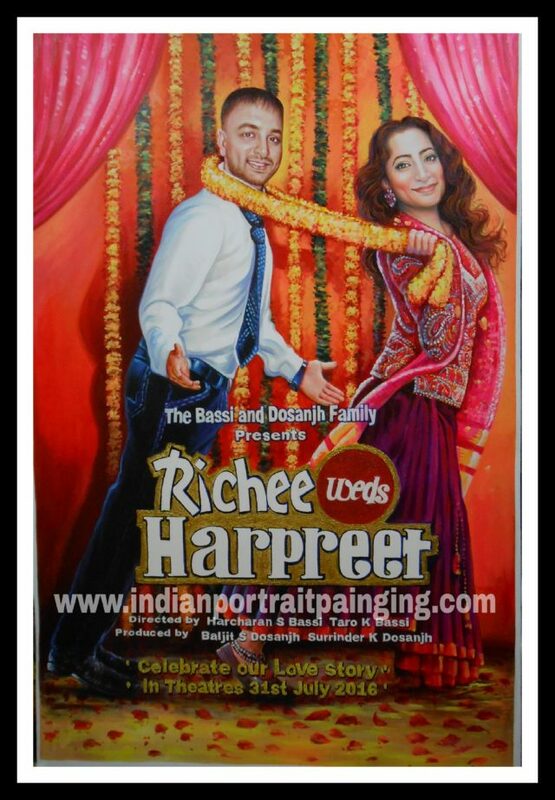 Our customized hand painted Bollywood poster are a big hit at weddings both at display as well as gifts. We have designed more than 2,000’s Customized style Bollywood posters for our clients. To make your wedding unique share your ideas or contact our Bollywood posters studio’s team to design your Bollywood poster save the date card. Customized your save the date cards with Bollywood movie posters. Add your photo and also special message in your Bollywood poster save the date card to worth keeping and remembering. Design your hand painted Bollywood poster save the date poster and create a statement that get noticed by your guests. Customise with confidence at Bollywood posters studio and get 100% satisfaction. In our unique Bollywood poster save the date cards service our team of Bollywood posters studio artists will custom paint your faces in any of your favourite Bollywood movie posters. Bollywood posters save the save the date cards are interesting and unique idea. Bollywood posters studio offer quality work and product which memorized for life time and have no expiry date. Express yourself beautifully with the customized Bollywood save the date cards posters.